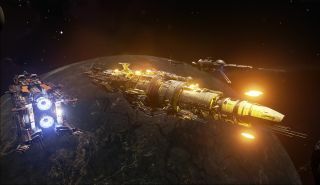 Fractured Space was announced last month as a multiplayer tactical combat game between capital-class spaceships, developed by the team behind Strike Suit Zero, now known as Edge Case Games. The studio said in the announcement that Fractured Space would be on Steam Early Access before the end of the year, and sure enough, here it is. It's still fairly early in the development process and thus there are a number of known technical problems, ranging from "rare" lockups when in the in-game ship selection menu to network stability and frame rate issues. There are also balance issues to work out; to that end, the teams asks players to "please head to the forums to speak your mind." That, of course, fits in nicely with its promise of an "open development ethic," as does its request that players join its forums to discuss the game and make use of the fracturedbugs.com site to formally report any technical problems. I'm not in the habit of recommending games I haven't played, especially Early Access releases, and I'm certainly not going to do so here. But Strike Suit Zero was reasonably cool and this Early Access trailer is pretty sweet, so I will say that I'm cautiously optimistic. Valve recently updated its Early Access rules and guidelines with a section asking developers not to make "specific promises about future events" like release dates, and as far as I can see there's no indication as to when Fractured Space will be out on the Steam store page. But Edge Case said in the original announcement that it should be ready to go sometime in 2015.